Looking for a great location for your business to grow? Not only do we build residential construction but we are also constructing 3 commercial buildings in Magnolia Commons of Glen Carbon, IL. Customize your own space to meet all your businesses needs and give us a call today! 618.205.3236. 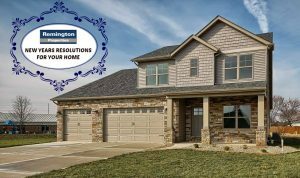 New Years Resolutions For Your Home! Your house is a glutton, gobbling energy like a starved elephant. Gain control by trimming energy use. A good place to start is your HVAC ductwork. Ducts are notorious energy-wasters, leaking your heating and cooling air through holes and loose connections. Sealing and insulating your duct work can improve the efficiency of your heating and cooling system by as much as 20%, saving you $200 per year or more, according to Energy Star. You’ll make your home more comfortable, and a more-efficient system helps extend the life of your furnace, air conditioner, or heat pump. Because ducts are usually hidden inside walls, ceilings, attics, and crawl spaces, sealing and insulating them may be a difficult and time-consuming DIY job. If you can’t reach all your ducts, concentrate on those that are accessible. Use duct sealant — called mastic — or metal-backed tape to seal the seams, holes, and connections. Don’t use the confusingly named “duct tape,” which won’t provide a permanent solution. Be sure to seal connections at vents and floor registers — these are likely places for leaks to occur. After sealing your ducts, wrap them in fiberglass insulation. Most hardware stores and home improvement centers have insulation wrap products made for ducts. 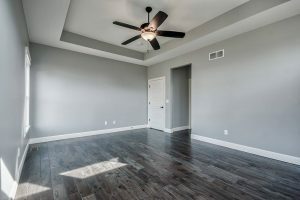 A professional heating and cooling contractor will charge $1,000 to $4,000 for the work, including materials, depending on the size of your home and accessibility to your ducts. The EPA lists indoor air quality as one of the top environmental health hazards. That’s because indoor air is full of potential contaminants, such as dust, mold spores, pollen, and viruses. The problem is at its worst during winter, when windows and doors are shut tight. Maintain your HVAC system and change furnace filters regularly. Use the highest-quality filters you can afford ($10-$20) and change every month during peak heating and cooling seasons. Use localized ventilation in kitchens and bathrooms to remove cooking fumes, smoke, and excess humidity. Make sure ventilation systems exhaust air to the outside of your home, rather than your attic crawl space or between ceiling joists. In fireplaces and wood stoves, burn real firewood rather than pressed wood products that may contain formaldehyde. Use a portable air cleaner to help cleanse the air in single rooms. Portable air cleaner types include mechanical air filters, electrostatic precipitators, ion generators, and ultraviolet lamps. Note that each type of air cleaner is designed to remove specific pollutants; no portable air cleaner removes all pollutants. Be wary of air cleaners that generate ozone — a known lung irritant. 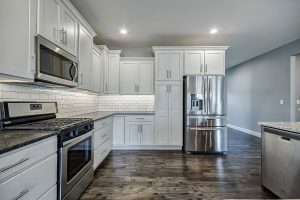 Creating a yearly budget for home improvement and maintenance helps prevent overspending, and encourages you to put aside money for major replacements — such as new roofing or a kitchen appliance — that come up every few years. Protect your home finances by knowing how much you’ll probably spend each year. Data from the U.S. Census Bureau says that average annual maintenance and home improvement expenditures are about $3,300 per household. That means the owner of a $250,000 home should budget between $2,500 to $7,500 each year for upkeep and replacements. Have extra at the end of the year? Save it for more costly upkeep and replacement items down the road — you’ll probably need it then. Letting credit card debt build up is a black mark on your credit history — and an indicator that you’re likely to file an insurance claim. The more claims, the higher risk you appear to be to insurance agencies, which lowers your insurance score. Low scores mean higher rates for home insurance. Keep payments on loans up-to-date. Don’t miss payment deadlines; if you do, notify your lender that your payment is forthcoming. Delinquent payments signal insurers that you can’t manage your money — resulting in a lower insurance score. No excuses — that clutter has got to go! Start by creating more storage space so you can stash stuff easily. At wit’s end for new storage space? You’ve probably got storage solutions you didn’t know you had. 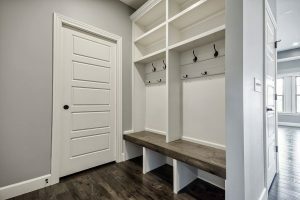 Put up a high shelf between the walls of a narrow hallway, and tuck storage in out-of-the-way nooks, such as under-stairs solutions and between wall studs. If your small home is pinched for space, don’t despair: There’s still room for storage. Shoe organizers ($20) do more than hold shoes — use them to store keys, notepads, and cell phones. At about $300 per drawer, have a cabinetmaker install drawers in the toe kicks of your kitchen cabinets for napkins, cookie sheets, and appliance manuals. In a world that often seems topsy-turvy, a little altruism helps restore balance. You can volunteer your time and energy to help others, and at the same time help promote safety and preserve the value of your neighborhood. A neighborhood watch program fosters a sense of community and helps stop crime. Set up meetings with neighbors to discuss concerns and priorities. Gather facts to present at the meeting: What kinds of crimes happen nearby? Are there patterns? Ask a local police representative to come to your first meeting to answer questions. Start a community garden. Bring together neighbors for bonding, eating healthier, and saving on groceries. A 4-by-16-foot raised bed garden plot provides $200-$600 worth of food annually. As the organizer, you can expect to spend 20-30 per month for six months getting your community garden going. Our houses are thirsty. The average household uses about 400 gallons of water each day, or almost $700 per year in water and sewer costs. Making a few simple changes, such as installing EPA-certified WaterSense products, could trim up to $200 from your annual water bill. Add to that energy savings from reduced costs to heat water, and your yearly savings could reach $300 or more per year. Low-Flow shower heads include technology that reduces the amount of flow yet keeps pressure up, resulting in shower streams that are powerful and satisfying. They cost from $10 to $150, and installation is an easy DIY job that takes only minutes. Replacing your pre-1994, water-guzzling toilet with a low flow toilet prevents $90 worth of water costs from being flushed away. HE (high-efficiency) toilets use compressed air and electric water pumps to flush with less than 1 gallon of water; older models required up to 8 gallons. Plant a tree. Pile the clan into the family wagon and shop for a tree that’ll become a new member of your family. Have your kids name it and help care for it. You might have to dig the hole, but everyone can take turns adding mulch and watering it. A bonus: planted where its shade will protect your house from summer sun, a $50-$100 tree cuts your yearly energy bill by $100 to $250. Make a home emergency preparedness kit. Make a scavenger hunt of gathering up all the necessary supplies, such as flashlights, toilet paper, and duct tape, and assemble your kit during an evening together. It’s a good, non-scary way to teach small children about what to do if there’s an emergency. If you want less to worry about, install low-maintenance materials and products designed for durability and long, trouble-free service. LED bulbs last a phenomenal 20,000 to 50,000 hours between changes, or about 18 to 46 years when used for 3 hours each day. Although the initial cost is high (about $40 per bulb), LED bulbs pay for themselves in energy savings in about 10 years. Classic ceramic tile comes in many colors and textures, but at its heart it’s incredibly tough, stain-resistant, and impervious to moisture. 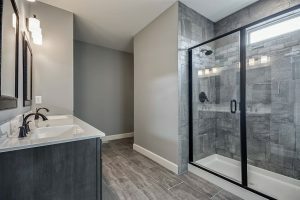 You can count on ceramic tile’s good looks to last for decades on floors and walls without needing repair or replacement. 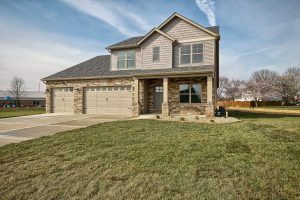 Quality shines in this new construction home conveniently located in the Cloverdale Subdivision. 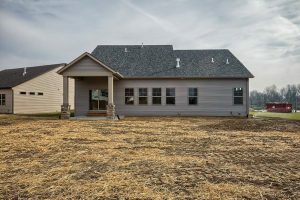 This 1 1/2 story floor plan is the layout you have been searching for with hardwood throughout the main living area, large cased windows to allow great natural light, & an open feel for relaxing and entertaining. 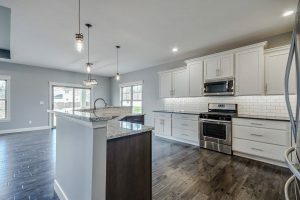 The kitchen features stainless appliances & hardware, cabinets with crown, granite counters & tile back splash. 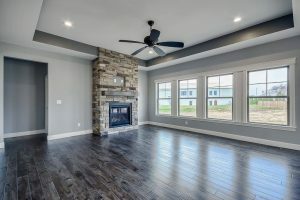 The living room boasts a stone fireplace & tray ceiling. 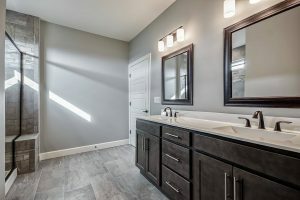 Master suite has large walk in closet with custom cabinetry, bath with tile shower & dual vanity. Laundry & drop zone on main level. Three additional bedrooms and 2 full baths upstairs for space & comfort. The covered patio will be a favorite place to escape at the end of the day. 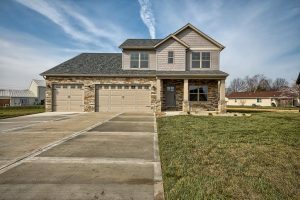 Conveniently located close to parks, trails, shopping, & schools, this home has everything minutes from the front door. 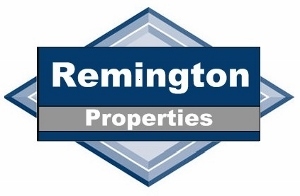 Monthly HOA fee of $75 includes lawn maintenance & snow removal, so move in and relax. 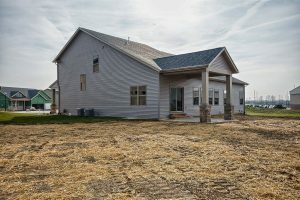 Why build a custom home? The answer is simple; a custom home enables you to have the home that best fulfills your personal requirements and desires. 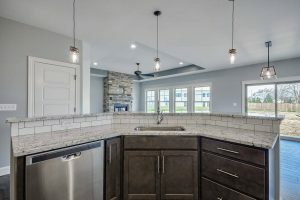 Choosing to build a custom home allows you the total freedom to decide on features such as the building lot, style of home, the floor plan, types of flooring and cabinets, and lighting, along with a multitude of other options. Virtually every aspect of the home design is for you to decide.